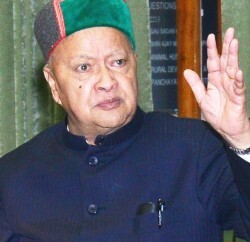 Chief Minister Virbhadra Singh announced to constitute a High Power Committee under the chairmanship of Chairman H.P. Electricity Regulatory Commission to remove bottlenecks in execution on Small Hydro Electric Projects (SHPs) in Himachal Pradesh so that work on these could be expedited for their timely completion. The Committee would submit its report in a month. Chief Minister was speaking at the One Day Meet on ‘Speedy Development of Small Hydro Electric Power Projects in H.P,’ organised by Bonafide Hydro Power Developers Association, H.P, in collaboration with HIMURJA & Ministry of New and Renewable Energy (MNRE) GoI at Hotel Holiday Home, here today. 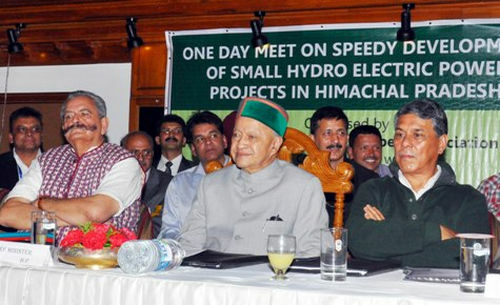 Virbhadra Singh said that Government intends to harness Hydro Power Potential speedily not only through SHPs but also by fast execution of medium and big hydel projects. He said that Government would facilitate all Independent Power Producers (IPP) and would take all necessary steps to harness power potential expeditiously. He said that High Power Committee would look into the problems of Small Hydro Power Developers and suggest recommendations to simplify the procedures of granting various clearances. He said that he was aware of problems being faced by the IPPs and in order to execute SHPs speedily the Committee would gave its suggestions which would be placed before the Cabinet. Chief Minister said that the Committee would recommend that all the clearances would be given in a specific period and concerned officers would be held responsible for any delay and laxity. He said that all sanctions and approval should be ensured in a stipulated time by the concerned authority. He said that Panchayats and local people should also cooperate with SHPs, as they would also be benefited by the projects. He said that IPPs should also take care of social responsibilities and be considerate towards the genuine demands of local people. Chief Minister said the State Government has given priority to harness the immense Hydro Power Potential in a time bound way. He said that SHPs are environmental friendly and cause least disturbance to the local population. He said that his Government had given priority to develop these projects on faster track, as they encourage Himachali entrepreneurship and provide wider and equitable distribution of opportunities for employment and development in the State. 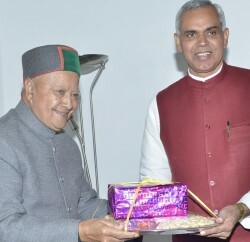 Virbhadra Singh said that though Himachal was pioneer in the field of Hydro Power development, but much was needed to be done to exploit the Power Potential in a stipulated time. He said that he has always given priority to the power sector and it was during his previous tenure that Hydro Power Policy of H.P. was notified in the year 2006. MPP and Power Minister Shri Sujan Singh Pathania said that the Government was concerned about various problems being faced by the IPPs and would take effective steps to remove the hurdles. He said that State Government would facilitate the SHPs and unnecessary formalities would be done away and procedure of clearances would be simplified. 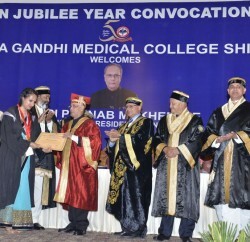 He said that Government had started allotment of SHPs in 1995 when Virbhadra Singh was Chief Minister. Pathania said that incentives were given to the Himachalis under Power Policy-2006 by reserving the projects upto 2 MW exclusively for them. While allotting projects having installed capacity of 2 MW to 5 MW preferences was being given to the Himachalis. He said that it was difficult for the developers of small projects to sell and evacuate the power in open market therefore the HPSEB Ltd. should facilitate them by buying power from them. Bonafide Hydro Power Developers Association, H.P. President Shri Rajesh Sharma apprised the Chief Minister about the problems and complications being faced by the SHPs in the State. He requested the Chief Minister to simplify the procedures for executing SHPs. He said that projects upto 5 MW should be allotted exclusively to the Bonafide Himachalis and priority should be given to Himachalis for projects from 5 MW to 25 MW. He said that instead of so many agencies, HIMURJA should be made sole agency to grant all approvals and clearances. SAI Engineering Foundation CEO Raj Kumar Verma gave a presentation on Small Hydro Power Development in Himachal Pradesh, its problems and suggestions. He said that 475 SHPs of 1215 MW were allotted for execution since 1995-96 in the State, out of which only 59 projects having 225 MW capacity had been commissioned so far. He said that on an average about three projects of 12 MW werebeen completed per year and it would take more than 100 years to complete the allotted potential at this rate. He requested the Chief Minister to take appropriate action to remove the hurdles in order to expedite the commissioning of SHPs in the State. Independent Power Producer Shri Maan Singh Thakur presented vote of thanks. MLAs Sarv Mansa Ram, Karan Singh, Karnesh Jung, Mayor Sanjay Chauhan, Deputy Mayor Tikender Panwar, Chairman, HP State Electricity Regulatory Commission Subhash Negi, Principal Secretary MPP & Power and Non Conventional Energy Sources K.Sanjay Murthy, Director SHPs MNRE GoI Bhuvnesh Kumar Bhatt, HPPCL M.D. D.K. Sharma, HIMURJA CEO Bhanu Pratap Singh, other senior officers and Independent Power Producers were present on the occasion.